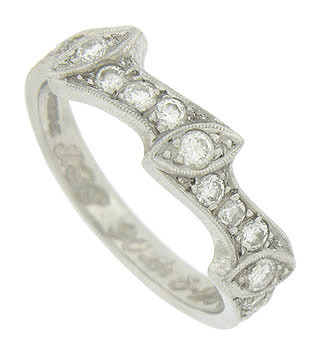 A curling ribbon interrupted by marquis figures adorns the face of this antique platinum wedding band. The figures are frosted with dazzling, round cut diamonds and outlined in delicate milgrain design. 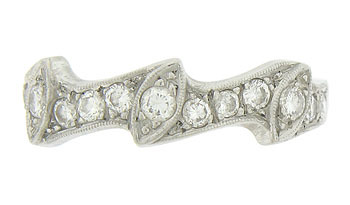 This antique platinum wedding ring is inscribed "JGB 90th 5-25-98". 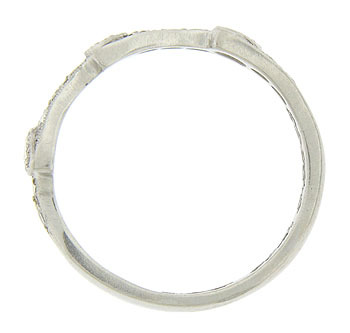 The ring measures 6.19 mm in width. Circa: 1930. Size 6 3/4.